Thank you for considering the Yosemite Valley Chapel and Yosemite Community Church (YCC) for your group event. Please read all of the information on this page before making your decision. 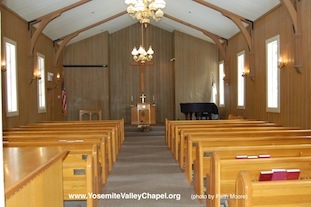 We are the ONLY OFFICIAL websites for the Yosemite Valley Chapel and Yosemite Community Church (www.YosemiteValleyChapel.org and www.YosemiteValleyChapelWeddings.org). These are our ONLY websites and we do not honor any other sites who claim to be the Yosemite Chapel. Note: The OFFICIAL Yosemite Valley Chapel website has the word "valley" in its web address and ends in the letters ".org". Please be careful and watch out for this. If you have any questions about this or would like to report any suspicious looking websites to us that claim to be the Yosemite Valley Chapel website, please call 209-372-4831 and ask for Faith or see our Contact Us page. For over a century, this humble house of God has served both visitors to and residents of Yosemite. It continues today as a place of Worship, prayer, meditation, and celebration. The Yosemite Valley Chapel is managed for special events and uses by the Yosemite Community Church under an agreement with the National Park Service. Please contact Yosemite National Park Office of Special Uses at 209-372-0459 to arrange for a First Amendment Permit. 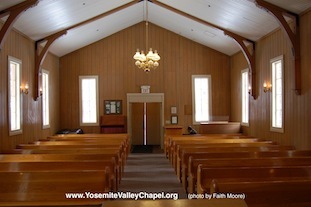 The Yosemite Chapel may be used on a Reserved and Non-Exclusive basis by a visiting group of less than 125 people as long as there is no other scheduled event. There is no access to the restroom and no attendant is available. As a visiting group, you may not exclude others from visiting the Chapel during your use. While there are no fees charged, donations for maintenance and upkeep of facility are accepted. Please keep activities consistent with the use of the Chapel. Groups may reserve exclusive use of the Chapel. The Chapel may be reserved during non-peak usage hours (before 9:30am and after 6:30pm). Cost is $100.00 per hour (one hour minimum). The restroom will be made available. The event is considered private. If your group reserves the Chapel during peak usage hours within two weeks of your desired event and the Chapel is not reserved for other use, then the hourly $100 rate will apply (excluding weddings). The same policies for group rates apply. An officiator fee of $300.00 will be charged if the Chapel minister is used. 1. Call Faith to place a 14-day hold on the date and time of your choice. Please have 2 or 3 choices before calling Faith at 209-372-4831. If your call goes to voice-mail, then please leave a message with your email address and phone number. 2. A Packet of Information will be emailed to you. 3. Fill out the 'Chapel Reservation Request Form' contained in the Packet and return it with the payment due. Faith will send your confirmation via your email address, so please remember to include your email address on your reservation form. The Chapel seats approximately 125 people and has a center aisle (approximately 4' x 40'), altar, organ, baby grand piano, and a simple worship setting. There are nine rows of pews on each side of the Chapel. There is only one rest room. Because this bathroom must meet the needs of not only your group, but also guests and the church staff, please take this into consideration for the number of people you plan to have in your group. The Chapel is wheelchair accessible by a wheelchair lift (elevator). the correct amount to remit! To confirm your reservation immediately, you may send a check for the total applicable amount along with your CHAPEL RESERVATION REQUEST FORM. This will allow us to confirm your reservation immediately assuming the date and time requested is available. You may call the church office to check the availability and arrange a tentative date and time. We will hold tentative reservations for 14 days to allow groups time to firm up their plans. To confirm a tentative reservation, please return the CHAPEL RESERVATION REQUEST FORM, along with your payment for all applicable fees. We will send you a confirmation of your reservation via your e-mail address. We hope you do not have to cancel your reservation; but if you do, please let us know in writing as soon as possible so we may make the Chapel available to others. If we receive the notice of your cancellation (post marked) at least 30 days before your group reservation, 50 percent of the Chapel and minister's fees will be refunded. If you notify us of your cancellation or schedule change less than 30 days before your group reservation, all fees are non-refundable. In the event of a park closure due to natural disasters or other unforeseen events beyond our control, we would be happy to reschedule your event. The last ten minutes of your reserved time must be set aside for clean-up. Remember that the road in front of the Chapel is one-way. If you are driving from the Yosemite Village area, give yourself plenty of time to drive to the El Capitan crossover and then to the Chapel. Your Chapel reservation is only for the time that has been set and it is likely that the Chapel will be in use for other services during the periods immediately preceding and immediately following your reservation. Please respect the allotted time. Please do not arrive earlier. Please do not allow other vendors to arrive prior to your allotted time. Please respect these policies. If you feel you need more time, you MUST call the Chapel and reserve an additional time slot: see Fees and Scheduling above. You are free to provide whatever music you wish for your group event (including instruments, tape players, etc.) as long as the volume and selections are within reason of what one would expect to hear in a Chapel. Because the Chapel is small, we recommend that decorations be kept to a minimum. NO tape or tacks are permitted in decorating. Nothing is allowed that will leave any remaining "print" on the Chapel. No decorations are permitted on the piano or organ and these instruments are not to be moved from their fixed locations. No use of candles is permitted outside the altar area. NOTE: Please designate a person(s) to pick up and remove all decorations from the Chapel and Chapel grounds. The last ten minutes of your reserved time should be used for this. PARK SERVICE PERMITS NO refreshments or food of any kind, NO EATING OR DRINKING AT THE CHAPEL OR ANYWHERE IN THE GROUNDS, INCLUDING THE PARKING LOT. Pets or animals of any kind (horses etc.) are not permitted as part of your group event. For more regulations about your pets, please see the Yosemite National Park's Pets web page. Please inform your group that everyone will be required to pay applicable National Park Service vehicle entrance fees to enter the park. During winter, be prepared for snowy and icy conditions by carrying the required tire chains in all vehicles from Labor Day through Memorial Day. If you do not have chains, you WILL be turned back to the closest town outside the park to purchase or rent them. The local 24-hour recorded road and weather information telephone number is 209-372-0200. It is especially important during the winter months for all those who attend your group event to be prepared with outdoor footgear since the paths to the Chapel may be snow or ice covered. IN WINTER TIRE CHAINS ARE REQUIRED. THEY MUST BE CARRIED IN YOUR VEHICLE EVEN IF CONDITIONS ARE NOT SNOWY OR THE ROADS SHOW NO SIGNS OF SNOW OR ICE. Please also be aware that during peak visitation periods, such as holidays and the summer months, you should plan for extra travel time due to increased traffic into the park and possible delays at the park entrances. In planning your travel to Yosemite National Park, please call the recorded Road and Weather line of the park at 209-372-0200 for the most up-to-date information. For more Yosemite weather information, please see the Yosemite National Park - Is there a best time to visit section. If you have further questions, please call our office at 209-372-4831. If we are not available to take your call when you phone, please leave a message on our voice mail and we will try to call you back as soon as possible.